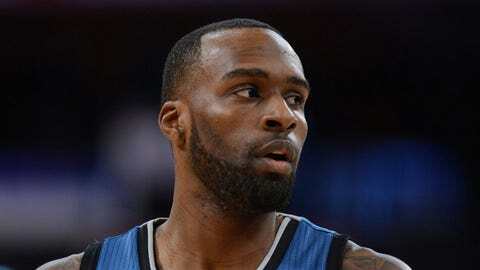 The Timberwolves are planning to send rookie Shabazz Muhammad, who is averaging 3.8 minutes and 1.1 points in 11 games, to the NBA Developmental League. MINNEAPOLIS — As many as three Timberwolves reserves could be on the move after this weekend. President of basketball operations Flip Saunders told KFAN 100.3 the team plans to send top rookie draft pick Shabazz Muhammad to the NBA Developmental League on Sunday. Coach Rick Adelman hasn’t been able to find many minutes for the No. 14 overall selection out of UCLA and thinks some increased playing time with the Iowa Energy — even if it’s just for a few games — may be beneficial. "I think it’s better to get experience and get some confidence that he has gotten better in different areas," Adelman said after practice Friday. "It’s hard when you don’t get to play as a young guy, and he’s always played." Muhammad has appeared in 11 games, averaging 3.8 minutes and 1.1 points per outing. If he’s indeed shipped to Des Moines on Sunday, he’d be able to join the Energy for their games Tuesday and Thursday in Reno, Nev.
Additionally, Minnesota has until Tuesday to decide whether or not to guarantee the contracts of forward Robbie Hummel and/or guard A.J. Price. All NBA salaries become guaranteed Jan. 10, and players must clear waivers before they’re off a team’s books. In both players’ cases, the Timberwolves could either guarantee the contract, waive the player and re-sign him to a 10-day deal (teams can sign players to such short-term agreements starting Monday), send them away in a trade or let them go and fill their roster spot with a free agent. Hummel has emerged as the top rookie on the Timberwolves’ roster. A 2012 second-round draft pick who worked his way onto the team via the NBA Summer League and training camp, he’s played in 25 of Minnesota’s 32 games, started twice and averages 10.9 minutes and three points per game. He’s set to make a league-minimum $490,180 this season. Price is also on a minimum salary of $947,907. There’s a good chance the fifth-year journeyman will be let go to clear cap room, as he’s appeared in just 13 games despite being healthy all season. The potential moves could be made in conjunction with the return of Chase Budinger (damaged left-knee meniscus) and/or Ronny Turiaf (fractured right elbow) next week. Neither is expected to play Saturday against Oklahoma City, but Adelman sounded more and more hopeful this week their comebacks could come very soon. Turiaf scrimmaged for the second time in as many days Friday and never came out for a rest, Adelman said. Luc Richard Mbah a Moute (groin), Nikola Pekovic (ankle) and Ricky Rubio (groin) all sat out of practice for what Adelman described as minor tweaks. Pekovic and Rubio should be available Saturday, while Mbah a Moute’s status remains up in the air.